The process of spermatogenesis begins with the spermatogonia that have diplod number of chromosomes. These spermatogonia are type of stem cells that undergo cell division via. Process of mitosis. 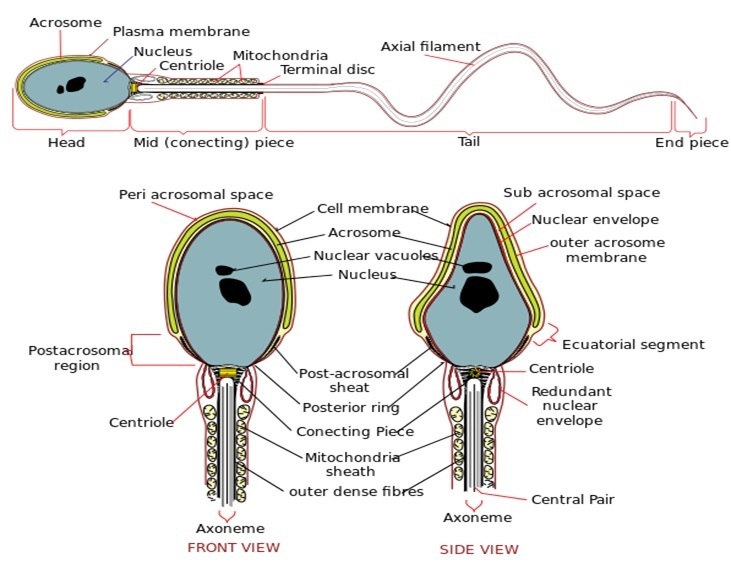 In this process some spermatogonia remain attach to the basement membrane as the reservoir of cells for the later stages whereas other passes through the blood- testis barrier, develops and differentiate to form primary spermatocytes. Primary spermatocytes thus formed are also diploid and after a short interval time period, it replicates and undergoes meiosis 1 to form secondary spermatocyte. Now, this secondary spermatocyte are haploid. As we know that chromosomes consist of two chromatids hence the separation of these chormatids takes place in meiosis 2, thus forming 4 haploid spermatids. 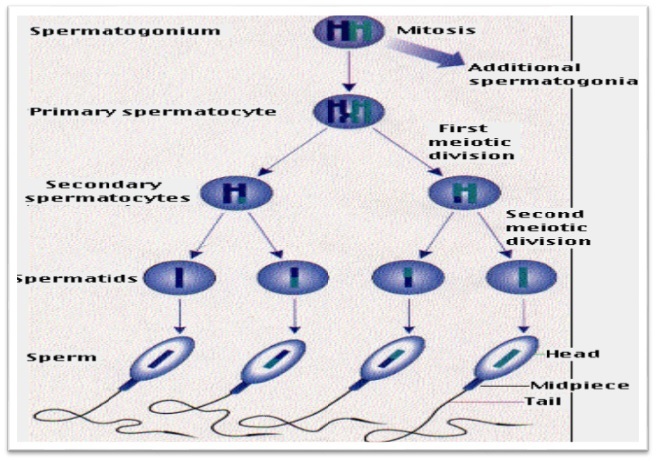 After the division process, spermiogenesis occurs by which sperms are formed from the spermatids. The function of sertoli cell comes in play, thus clearing excess cytoplasm and now the individual cell develops acrosome and flagellum. Then spermiation takes place where the sperm cells are released to sertoli cell that directs the movement of sperm to the lumen of seminiferous tubules. Hence, this is the complete process of spermatogenesis that involves different steps. Now when the sperm cell are made, it is important to know that how a sperm actually looks like, i.e. the structure of the sperm so that it gets prepared for the fertilization process. Structure of sperm: millions of sperms are made and these many sperms completes the process of spermatogenesis. Sperm is well designed consisting of several structures that helps in reaching and penetrating the secondary acolyte from female. The head part of the sperm consist of 23 chromosomes inside a nucleus that are highly condensed. Thus, the upper part of the nucleus is covered with the acrosome, a cap like structure that is filled with enzymes and helps in the penetration process. The body is divided into different parts: neck, middle piece, principle piece and end piece. Neck consist of centrioles ,middle piece consist of mitochondria for locomotion of sperm. One of the peculiar characters of a sperm is that, if it is once ejaculated from the male’s reproductive tract and enters female’s body, it cannot survive more than 48 hours. Thus, for fertilization process must take before this time period. Increase secretion of LH and FSH. LH stimulates Leydig cell to secrete testosterone. FSH and testosterone act synergistically on sertoli cells thus stimulate secretion of ABP. ABP thus, binds to testosterone, thus keeping its concentration high. Increase in the level of spermatogenesis. Release of inhibin by sertoli cell. This way different hormone acts accordingly, thus assisting the complete process of spermatogenesis. Therefore, this is the complete process that involves different organs, process and organs of male reproductive system. The proper functioning of all the organs involved are necessary so as to maintain proper reproduction capacity and hence, to avoid any kind of abnormalities or diseases that can retract from the proper functioning of the body system.